Which data are available, or not? What is the best way to publish open data? Are there any legal or ethical liabilities? How to judge the quality of the data on offer? The symposium ‘Connecting data for research’ focuses on good practices for the collecting, structuring, visualizing and sharing of research data. Mireille van Eechoud, professor of Information Law at the University of Amsterdam, and Barend Mons, professor in Biosemantics at LUMC, Leiden, will share their visions on the challenges and opportunities for sharing open data in the future. In the break-out sessions, some 20 researchers from a variety of disciplines will highlight the data-bound issues the faced in their research, the solutions that they found, the tools they choose to use, and the reasons why they did so. The symposium aims to offer opportunity for sharing experiences and ideas; it encourages discussion among researchers, but also with service providers facilitating the field of data driven science. The Symposium is open to researchers from all areas of study and all institutions. Registration is free of charge but required through an online registration form. 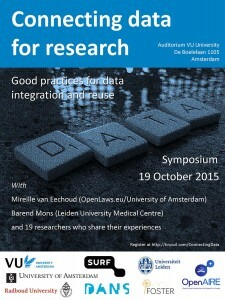 The symposium ‘Connecting data for research’ is organized by VU, UvA, Leiden University, Radboud University, DANS and Surf. It is made possible by a generous financial contribution from Foster.